For this month’s Customer case study, we bring you the incredible work from technology teacher turned retired hobbyist Ray Taylor. Having over 30 years of teaching experience, Ray has seen the growth of technology use in his class workshops and had integrated it all into his classes. The one tool he has particularly taken a further interest in is CNC machining. Woodworking is a hobby for me now, I taught technology education in public schools for 31 years. My first assignment was in technology education where I spent 15 years teaching middle level students. After that, I followed the evolution of technology and implemented it into my subject areas of drafting, metalworking, welding, plastics and woodworking. I finished my career with a fully equipped technology lab featuring CAD CAM, robotics, electronics. Pneumatics, MIDI, graphic arts, aviation, forensics etc. Now that I am retired, I am able to spend time woodworking for myself. My main interests are in boxes, segmented turning and clocks. 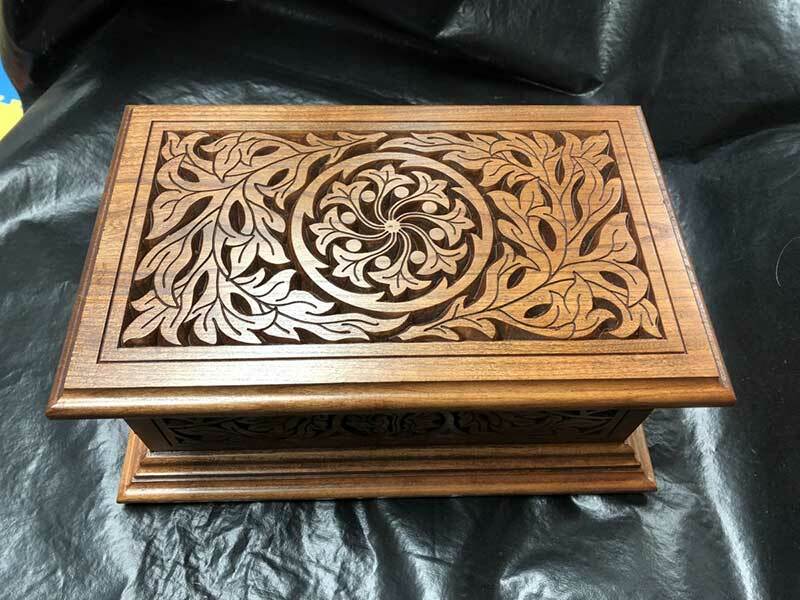 Many of my box projects incorporate complex inlays and intricate joinery. 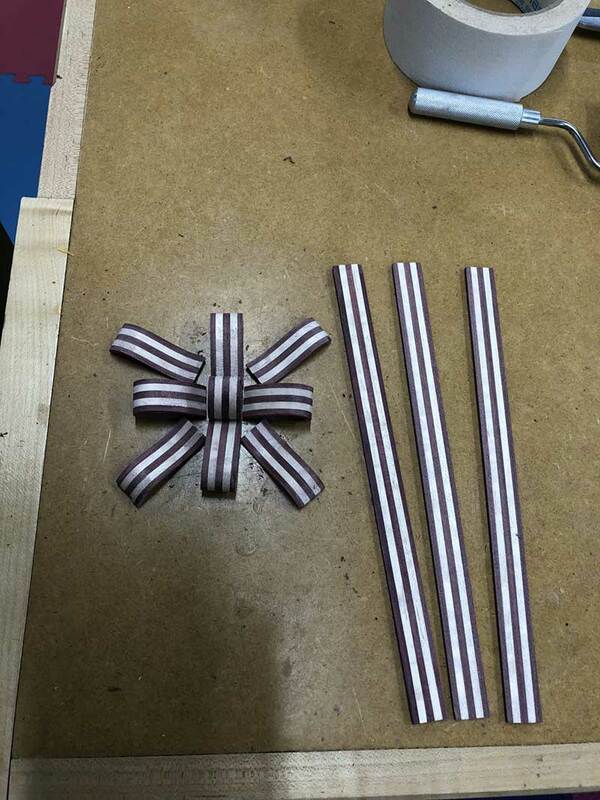 The more complicated the better, I really enjoy figuring out how to make complex components. 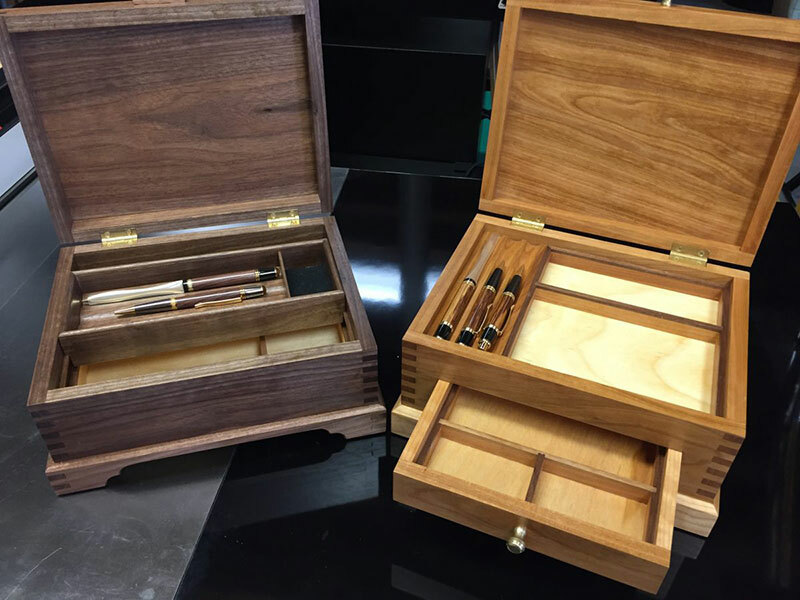 I became interested in CNC technology because it simplifies and makes the processes easier for much of what I create. Generally, I draw detailed plans with CAD for my projects. It made sense for me to then to be able to program a machine to perform some of the processes to build those projects. During my years of retirement, I have built up a fully equipped wood shop. I use all the standard stationary power tools including a CNC machine. When I purchased my CNC machine, I also purchased Vectric software to create my toolpaths. In addition, almost everything I build I first draw up using vcarve Pro or CAD. I use vcarve Pro for all of my CNC Work. I cannot say enough good things about this software package. It is exciting to have this kind of technology in my shop because of all the possibilities it opens up for my projects. I am constantly amazed at the absolute ease of use and intuitiveness of this software. Vcarve inlays are a feature that I was not expecting but absolutely love. I can now create designs that would have been impossible to do by hand and I am constantly finding new ways to create with my CNC. Vectric software has never let me down. It always provides a way to design things easily and is upgraded and made better all the time. Many of my concepts and ideas for projects come from the internet, books and things that I see in retail stores. 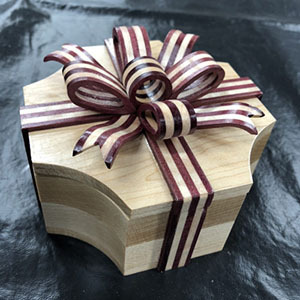 Ribbon boxes were something that I had always cut out with a scroll saw. They are quite common in scroll saw work. I thought that it would be a perfect job for the CNC. As it turned out I was able to precisely cut the same parts out with toolpaths from vcarve as I could with a scroll saw, only much easier with a CNC machine. I have done many designs on clocks and jewellery boxes using a process that, by hand, is called “chip carving”. That is an art in itself, which I could never do. I used vcarve software to create my designs for the “chip carving” toolpaths and then a v-bit to create them on my CNC. The bitmap tracing feature in vcarve made the job easy. I use the Axiom CNC. Mine is the basic one with a router. In my case, I am a hobbyist. I don’t make money with it. It is an enhancement to all the other tools I use. I don’t carve large pieces that require extended run time, nor do I need to place a half sheet of goods under the gantry. Space was a consideration also. CNC machines can take up lots of floor space simply because of the way they operate. The basic 24x 24 Is the perfect machine for me. I love it. 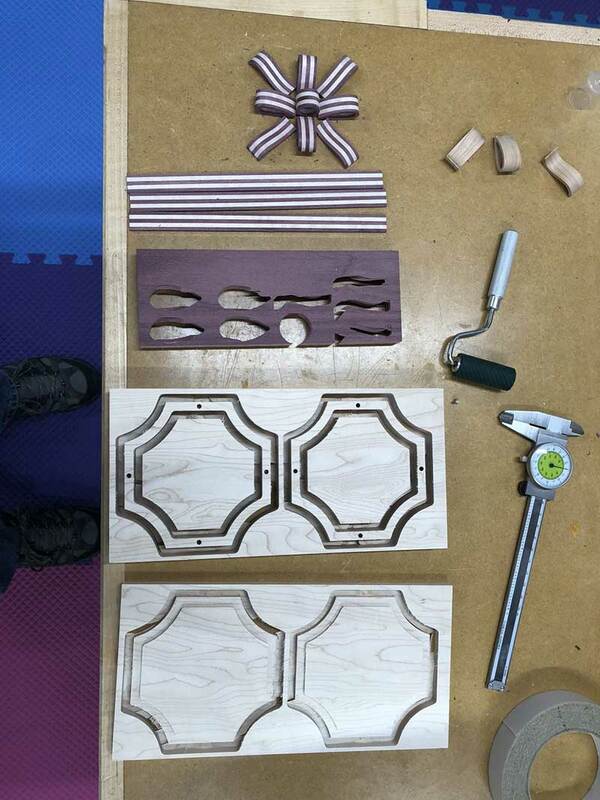 I have made ribbon boxes with my scroll saw in the past. This particular one is from a scroll saw pattern book. The shape of the box and the ribbon is really up to individual imagination. The box could be round, oval, or polygon, whatever you like. The flat ribbon strips are best ripped on a table saw. The curved bow pieces do not have to be a definite shape they can be whatever one wants them to look like. They are easily designed with vcarve software. The ribbon box required that layers of contrasting wood be glued and clamped together to represent ribbon. I get these thin pieces by re-sawing on a bandsaw and then drum sanding to the thickness of .125”. Gluing and clamping must be tight with no gaps. I found that I had better success cutting out if the piece had two days dry time, as the centre was still a bit wet after one day. I used a .125” up cut end mill with profile tool paths to cut the ribbon out. The nesting feature in vcarve allowed me to use the material efficiently. I did use tabs on the ribbon pieces. Since they were so delicate and small, I did not cut through the material. Instead I left about .003” in addition to the tabs. To remove the parts I used a drum sander to sand down the small amount of thickness that was left and then cut the tabs and removed the parts. I have found that that this technique works quite well in certain situations. I found that high RPM and slow feed gave me good results for finish although some sanding was required before assembly. I used a scroll saw with an extremely fine blade to cut the ribbon ends and small pieces to be glued onto the box. A Dremel tool is handy for small touch up also. The work is a bit tedious at times but that is what I love to do. Assembly of the ribbon on the box was accomplished with CA glue with quick set. The box itself is pretty straight forward. I cut two pieces from .75” stock using profile tool paths. I added small .125” dowel holes for alignment when gluing them together to make the depth of box that I wanted. If one had thick stock material a pocket tool path would be just fine. I made these cut outs with a .25” up cut end mill and a profile toolpath. The bottom and lid were cut from .625” thick stock and a “rabbit” joint was added around the perimeter of each piece to recess them into the box sides. I finish most of my pieces with spray satin lacquer. I am not sure what I will be working on next. I love to make boxes, clocks, bowls and vases from exotic wood. I love inlaying and precision. I am sure I will find something out there that will stir my imagination and motivation for my next project.